A major new temporary public artwork installed around Southampton’s Guildhall Square, at the heart of the City’s new Cultural Quarter, is being launched on Friday 16 July. The artwork is accompanied by a research project by Dr Sweetman, focusing on participants’ experiences of the project and how they feel about having taken part. City Portraits is part of the Creative Campus Initiative (CCI), a consortium of 13 higher education institutions in the South-East, including the University of Southampton, which is delivering an exciting programme of cultural events and artworks in support of the Cultural Olympiad. The CCI as a whole is recognised by the London 2012 Inspire programme. The City Portraits banners will be in place until October 2010. Laura Hensser is a Southampton-based photographer who graduated from the University for the Creative Arts in Farnham with a BA in Photography in 2008. She has been the recipient of the MI 2 (Prime Ministers Initiative Fund) to make work at the NID (National Institute of Design) in Ahmadabad, India and was recently awarded the ARC Award at the Aspex Gallery to make a new piece of work using sculpture. Laura has exhibited internationally and in the UK and has spent time in Iceland on the Nes artist residency program. 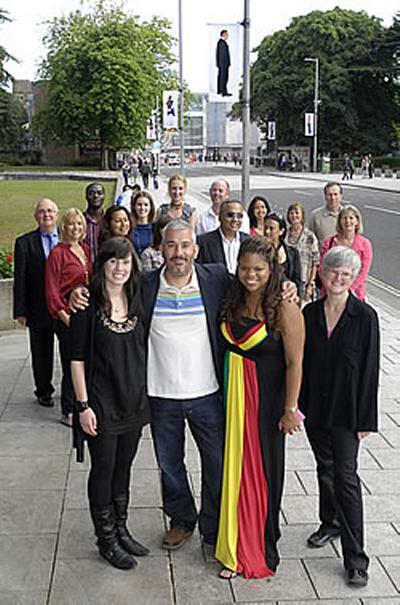 The Creative Campus Initiative is a consortium of thirteen higher education institutions in the South East delivering a dynamic programme of cultural events and artworks in response to the 2012 Olympics and Paralympics. Historical, cultural and social issues raised by the Games will be addressed by artists, students and academics alongside new learning materials and workshops with schools and local communities.